Throughout the Southern Hemisphere, exposure to ultraviolet radiation, due partially to the ozone hole over the southern oceans, is a major concern. Australia, for instance, has one of the world’s highest skin cancer rates, and an Australian friend in Santiago recently told me that schoolchildren in his country cannot go out to play without a legionnaire-style baseball cap that covers the neck and ears as well as the face. It’s an issue that concerns me, of course, ever since I had surgery to remove a melanoma about 18 months ago. The ozone hole over Argentine and Chilean Patagonia has long been notorious for its high UV index, but Chile’s Atacama desert is also a dangerous place for those of us with fair skin. At present, I’m in the city of Antofagasta, just south of the Tropic of Capricorn, and, as I head north, the sun’s rays are far more direct and, at high altitudes, the risk is even greater. In that context, I recall an incident nearly 30 years ago, when I was doing M.A. 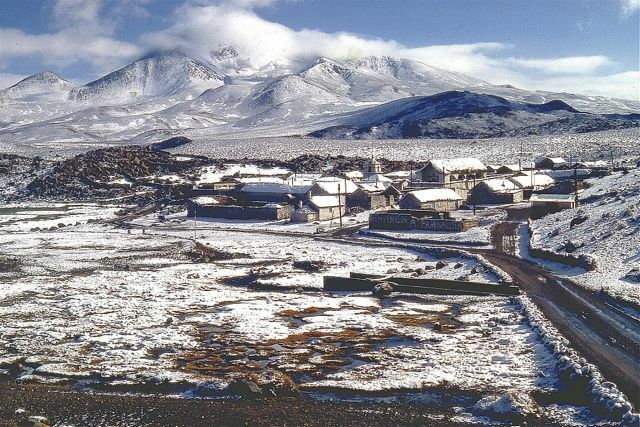 thesis research in the village of Parinacota (pictured above), at an altitude of 4,392 meters (14,409 feet), in Parque Nacional Lauca. At roughly 18° 10’ South latitude, the sun was powerful and, though I didn’t always wear a cap, I was not reckless about exposure to the sun. Two Australian visitors were far less cautious than I was. 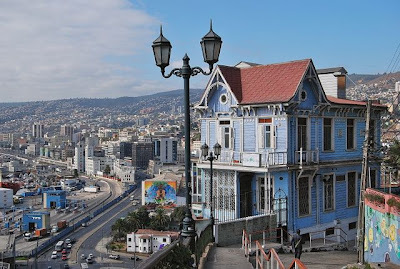 At that time, during the Pinochet dictatorship, foreign tourists were few, but the Aussies arrived one afternoon on the bus from the seaside city of Arica. The only place to stay was Conaf’s refugio, a sprawling structure originally built for a high Andean genetics research project by the University of Texas, if I recall correctly. It had two large dorms with reasonably comfortable bunks and, most of the time, I had one of those dorms to myself. The park rangers slept in the other one and, on this night, I shared mine with the two visitors. At that altitude, it froze almost every night, even in summer (when it sometimes even snowed, as depicted above), but the next morning was gloriously warm and sunny. The two Aussies took that as an invitation to sunbathe and, before long, they seriously regretted it. That afternoon, they were literally scorched red as lobsters and, on top of that, they suffered a severe attack of soroche (altitude sickness). There were no buses that day but, fortunately, they managed to get a lift back down to sea level. Whether they learned a lesson from their experience, I have no idea. 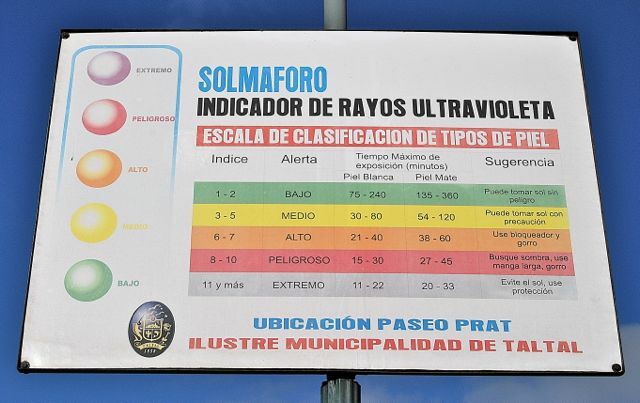 All that came to mind yesterday when, in the old nitrate port of Taltal about three hours south of Antofagasta, I saw the most detailed public warning about solar exposure that I’ve ever seen, in Chile or elsewhere. 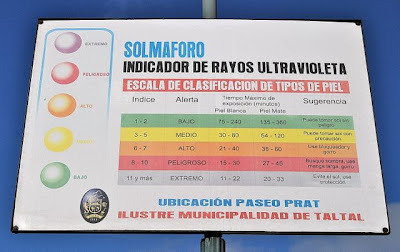 In fact, it’s a chart that suggests, according to skin type and the prevailing UV index, what constitutes a “safe” exposure to the sun, and what level of protection is necessary. Whether the chart in question has any scientific accuracy, I have no idea. But if it raises awareness of solar exposure among the population of Taltal – which also gets plenty of reflected rays off the Pacific Ocean – it should be for the better. It’s an anniversary of sorts. 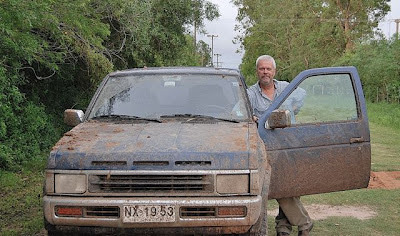 For the 500th post since I began this blog in November 2008, I have several observations on driving through Chile and on its highways. 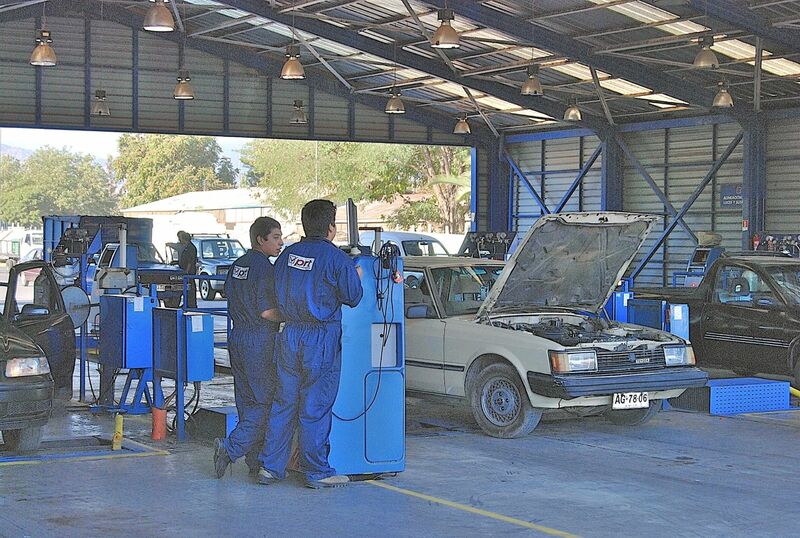 Over the past two decades, Chilean roads have improved dramatically. The longitudinal Ruta 5, the Carretera Panamericana, is now a divided highway of at least four lanes from La Serena in the north to Puerto Montt in the south. And three months ago, in the northern desert, a new four-lane divided stretch opened between the city of Vallenar and the beach resort of Caldera, bypassing the regional capital of Copiapó. That makes this a much quicker and safer route, as motorists no longer find themselves tempted to pass slow-moving mining trucks on dangerous curves or steep hills. One phenomenon of the freeway has been, as elsewhere, a series of roadside servicentros - drivers no longer have to leave the main highway to fill the tank, get a cup of coffee, a sandwich or a more elaborate meal, or use the toilet. Most of these are operated by the local energy giant Copec, which maintains utterly spotless facilities and, at the same time, provides free WiFi for anyone who stops at them - even if they don’t make any purchase. When I have to check my email on the go, this is extraordinarily convenient. 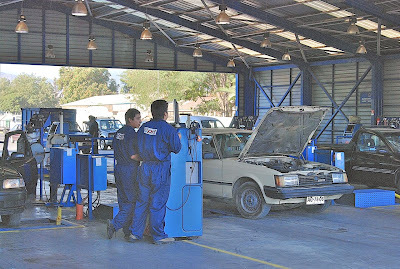 A far more basic service, though, is not free. Copec charges visitors to use the toilets (which often have showers, used mostly but not exclusively by truckers, for an additional charge). The charge is not high, about 150 pesos (roughly US$0.30), but what does it say about priorities when an optional service like WiFi is free and an essential service like a urinal is not? At a time when a Georgia demagogue thinks he can become president by promising gasoline at $2.50 per gallon, Chile is a reality check. 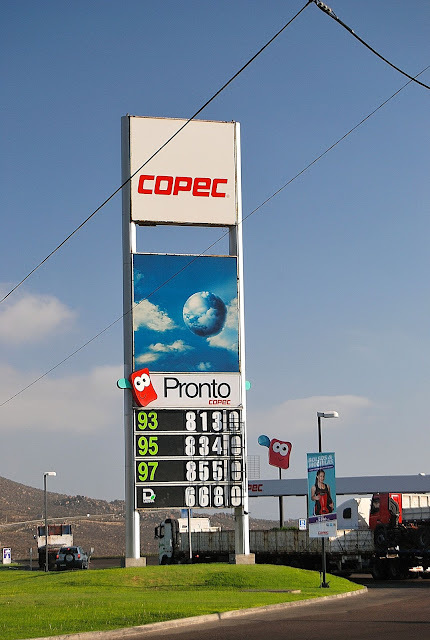 Like the United States, Chile imports and consumes more oil than it can extract (applied to petroleum, the word “production” is a horrible misnomer), and it’s a glimpse into the future. 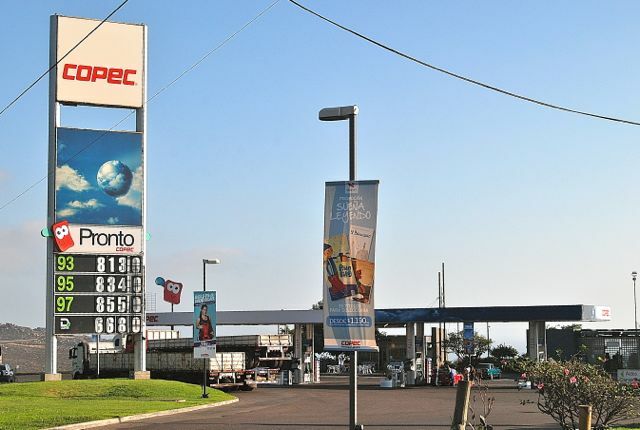 When I filled the tank yesterday at La Serena, the price for 95-octane gasoline was 834 pesos per liter which, at the exchange rate of 487 to the dollar, works out to US$6.51 per gallon. It’s going to get worse, for me at least, in the short term. 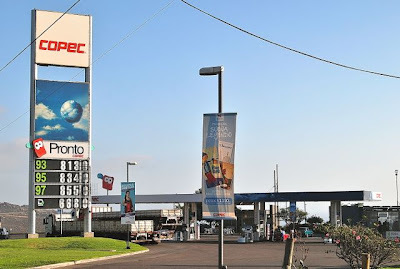 The farther you get from Santiago, north or south, the higher the fuel prices and, in the city of Copiapó, I’m barely a third of the way to the northernmost Chilean city of Arica. Chile, of course, faces oil shortages more acutely than the United States, but the trend is clear. Chile’s only notable fossil fuel resources are in the far southern region of Magallanes and, when that runs out, all the drills in the world won’t yield any oil. Meanwhile, Chile has enacted one of the world’s strongest drunk-driving laws, about as close to zero tolerance as it’s possible to get. More than a few people are upset that a blood alcohol level of .031 percent – compared with .08 in California – could send you to jail for driving while intoxicated. Just a single beer, a glass of wine, or a pisco sour could conceivably put you over the limit. I have no intention of endorsing drunk driving. It’s interesting, though, to contrast this legislation with the country’s timid tobacco-control laws. 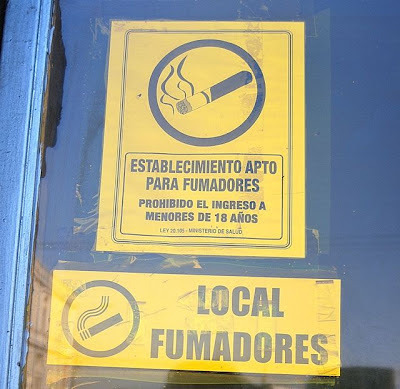 That’s particularly so when I just visited an American friend in La Serena whose 48-year-old Chilean wife, a non-smoker who grew up in a house of smokers, died of lung cancer last November. 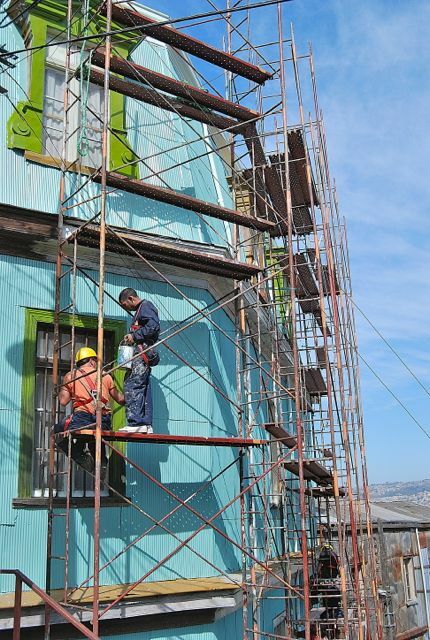 A couple days ago, in Valparaíso, I paid a visit to “rival” guidebook author Janak Jiri, who also owns the very pleasant Hostal Luna Sonrisa on Cerro Alegre. 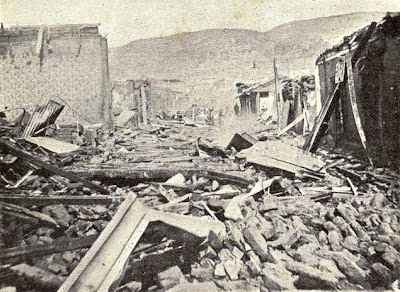 As we chatted, I noticed a framed front page from the San Francisco Chronicle dated August 16, 1906 – the day of the massive Valparaíso quake (estimated at 8.2 on the Richter scale) that killed nearly 4,000 Chileans (the image above comes from 1906). That’s about a thousand more than died in San Francisco’s world-famous quake just four months earlier. Janak told me he bought up the paper – whose masthead is virtually identical today - online for about US$15 several years ago. In any event, it makes a great conversation starter. It’s a measure of the similarities and historical links between California and Chile that the Chronicle, so soon after its own seismic cataclysm, would devote itself to what, for the time, was saturation coverage of a distant event. Even granting the evolution of media in the last century-plus, the huge Chilean quake of 2010 and the Japanese quake of 2011 got relatively less coverage. Meanwhile, at 4:23 a.m. this morning, my room on Cerro Artillería started shaking, waking me up briefly. I was too sleepy to time the duration but, on rising just before dawn, I learned from the USGS Earthquakes Hazard Program website that it was a magnitude 5.1 event with an epicenter near the town of Los Andes, about 68 km (42 miles) east of here, at a depth of 66.7 km. The only local report I’ve seen is from the Universidad de Chile’s Servicio Sismológico via the governmental Red Nacional de Emergencia. It rated a V for intensity on the Mercalli scale, with no indications of damage to persons, basic services, or infrastructure, and no suggestion of a tsunami. I would guess that the quake’s depth minimized any damage. As statistics go, it doesn’t get much more alarming than this: according to the Singapore-based Tobacco Atlas, nearly 40 percent of Chilean girls between the ages of 13 and 15 are current cigarette users, along with 28 percent of boys that age. 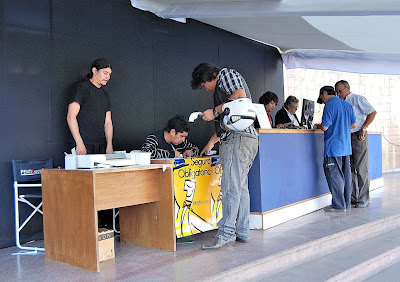 More than half are exposed to second-hand smoke, as roughly a third of all Chileans are smokers. These are among the worst figures in the world. I have remarked several times before about Chile’s timid tobacco laws which permit, among other things, that restaurants and bars can even decide whether or not to offer non-smoking sections (if they opt not to, they cannot admit anybody under age 18). 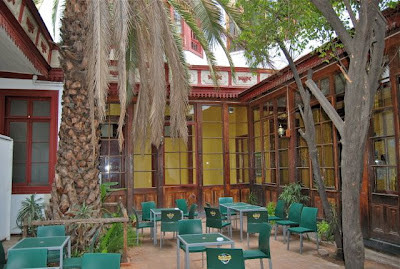 A distressing number of restaurants, including some of the most sophisticated, do not do so – some of them even put up a sign that says “We welcome smokers and non-smokers,” as if they were doing non-smokers a favor. In this sense, Chile lags far behind Argentina and especially Uruguay in a critical public health measure (it’s worth adding that there are provincial differences in Argentina, which is a federal state). Late last year, I mentioned the launch of the Patagon Journal, a bilingual Chile-based magazine created by US journalist Jimmy Langman of Puerto Varas. Now I’m informed that it’s available as an app for the iPad, and will soon be available for the iPhone and iPod Touch. This is a worthy project that provides all the latest information on Patagonia, particularly on conservation and environment issues. 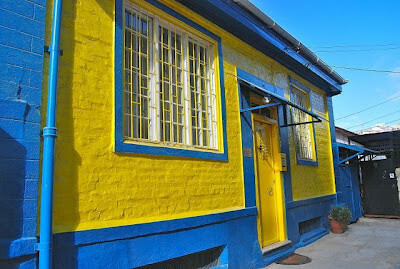 When I’m in Valparaíso, I often stay at The Yellow House (pictured below), a cozy B&B run by the Australian Martin Turner, his Chilean wife Lissette, and their two bulldogs. 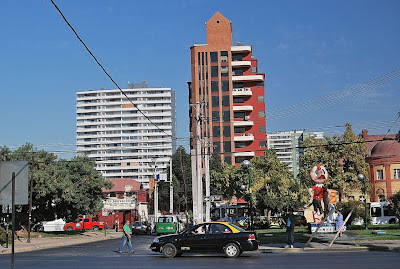 On Cerro Artillería, at the west end of downtown, it was a pioneer accommodation in a hills neighborhood whose development and renovation have lagged behind that of more fashionable areas like Cerro Concepción and Cerro Alegre, whose boutique hotels and fashionable restaurants have set the pace in this scenic city. 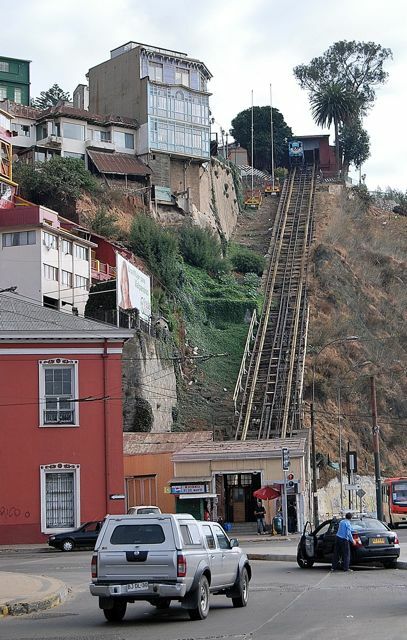 One factor in Artillería’s recent development may be the fact that it has a working funicular in a city whose reputation relies, in part, on this unusual but entertaining means of public transportation. 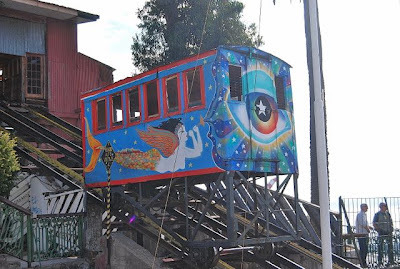 When I last updated Moon Handbooks Chile, though, “Valpo” had nine functioning funiculars of the 14 that remain (there were originally 33, but the rest have been dismantled). 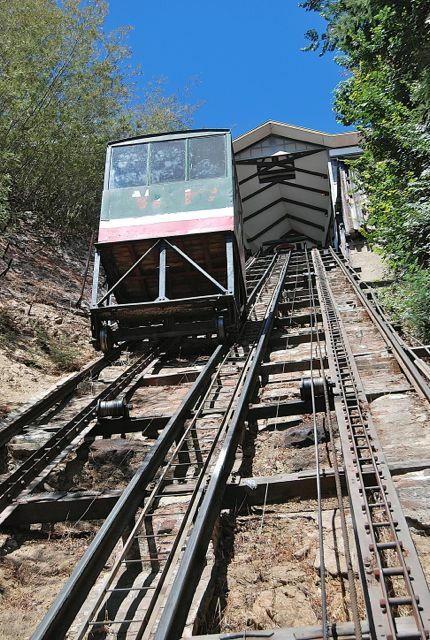 Today, though, Ascensor Artillería (pictured at top and below) is one of only four that remain in service. The El Peral, Turri, and Reina Victoria funiculars all serve the conspicuously tourist-oriented areas of Concepción and Alegre. Maintaining and operating an antiquated technology, of course, present challenges, and a couple others could return to service shortly. 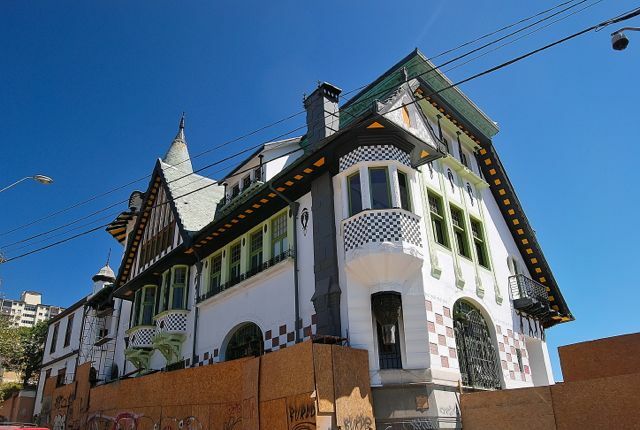 On the other hand, UNESCO has reportedly threatened to revoke the city’s World Heritage Site designation if authorities don’t make a greater effort to restore the remainder to a usable state. In fact, the ascensores make it easier for everybody – not just tourists - to get around this hilly city. 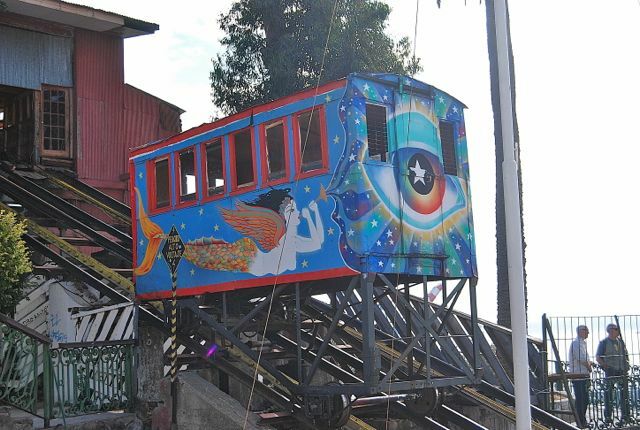 Meanwhile, thanks in part to its funicular, Cerro Artillería has gained attention as an accessible area of new businesses – such as the up-and-coming restaurant Casa Cuatro Vientos (pictured above), in a landmark house with spectacular views of the harbor (their annual New Year’s Eve dinner offers the best views of the city’s legendary fireworks show). Other cafes have arrived, and Martin and Lisette have set up a separate cooking class business, Chilean Cuisine, in a luminous loft apartment just across the alleyway from their B&B. I attended one of those classes (pictured below) on Friday and, when I have time, I’ll give a more detailed account of it. No, this will not be a polemic on global warming, though I share concerns over the environmental crisis of our time, and Chile’s one of the frontline countries threatened by climate change. 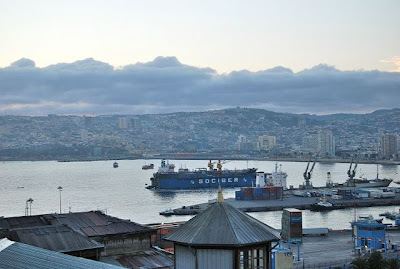 Rather, this article will describe the dilemma of those who travel from hot, sunny Santiago, to cool, foggy Valparaíso (pictured above). 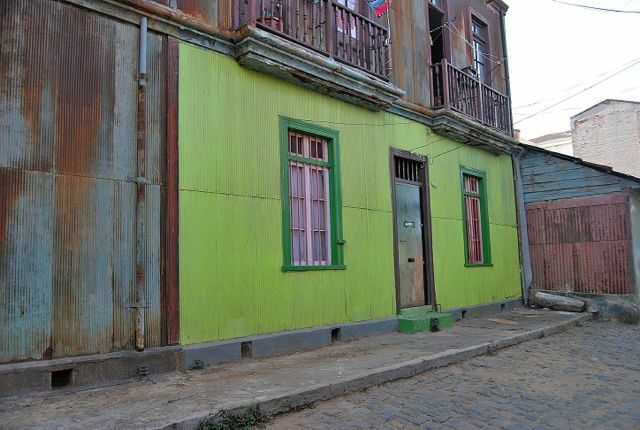 Recently I gave slide talks on Patagonia and Buenos Aires in the Santiago B&B/hostel La Casa Roja (pictured above and below), which gave me the opportunity to answer a wide variety of questions on those destinations. It wasn’t limited to that, though, and several people asked me about the best excursions in and around Santiago, and one of my top choices was Valparaíso, the country’s most colorful and unique city. 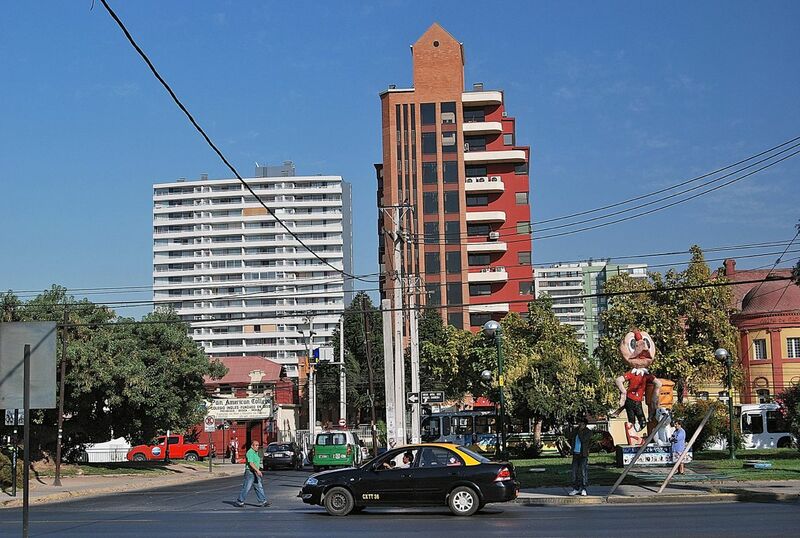 Though I’d always recommend staying overnight or longer, bus service to Valpo is frequent (about every 15 minutes) and fast (two hours) and, making it an ideal and inexpensive day trip. There is one surprise, though, that unsuspecting visitors need to know. Though it’s been hot in Santiago the entire month, it normally cools off at night, given its 550 meters above sea level; that hasn’t been the case for most of March, and that means many young visitors are only lightly dressed. 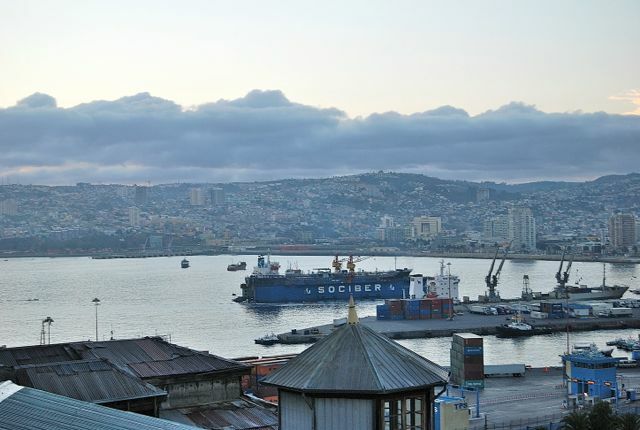 If they’re going to Valparaíso for the day, that can be a problem – it can get cool or even chilly here. 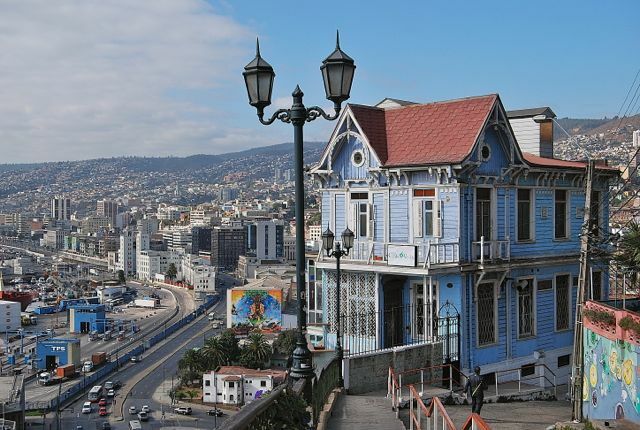 That’s because, like San Francisco, the twin cities of Valpo and Viña del Mar (the famous beach resort), sprawl along a Pacific shoreline that’s only a short distance from the cold Humboldt Current. That helps create the convective fog known as the camanchaca, similar to the afternoon fogs that spread inland over San Francisco – and legendarily leave Midwestern tourists shivering in their shorts and tee shirts. 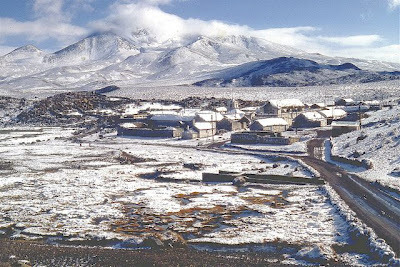 On the coast here, the daytime temperature here is typically 10° C (18° F) cooler than the Chilean capital, especially when the camanchaca comes ashore. Even if it’s clear and sunny, as it is today, it’s advisable to carry a sweater or jacket in this naturally air-conditioned city. While flying from Buenos Aires to Santiago in 2002, I found myself seated next to an Argentine, bound for New York on business who, because his government had frozen bank accounts, found himself cashless. 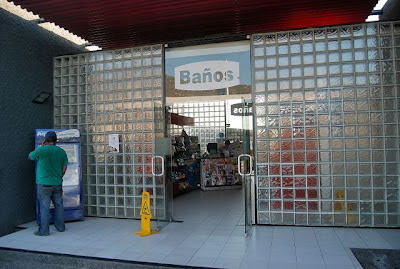 Imposed to prevent capital flight during a severe economic crisis, the so-called corralito had frozen all bank accounts in the country. In the days of credit cards, this might not sound disastrous, but paying even incidental expenses in any North American city meant, and still means, ready access to cash. Now, ten years later, history may be repeating itself for foreign-bound Argentines. Recently, as I reported in another blog post, the government required Argentines traveling abroad to get clearance from AFIP, the country’s counterpart to the US Internal Revenue Service, before purchasing dollars to take outside the country (Imagine the outrage if US citizens had, effectively, to request IRS permission to travel outside their borders). Recently, after another flight from Santiago to Buenos Aires, I shared a shuttle with a man from Neuquén who, to avoid the bureaucratic pitfalls of the AFIP, purchased dollars clandestinely at the rate of five pesos each (the official rate is about 4.3 per dollar, so the black market is once again alive, though less overt than it once was). 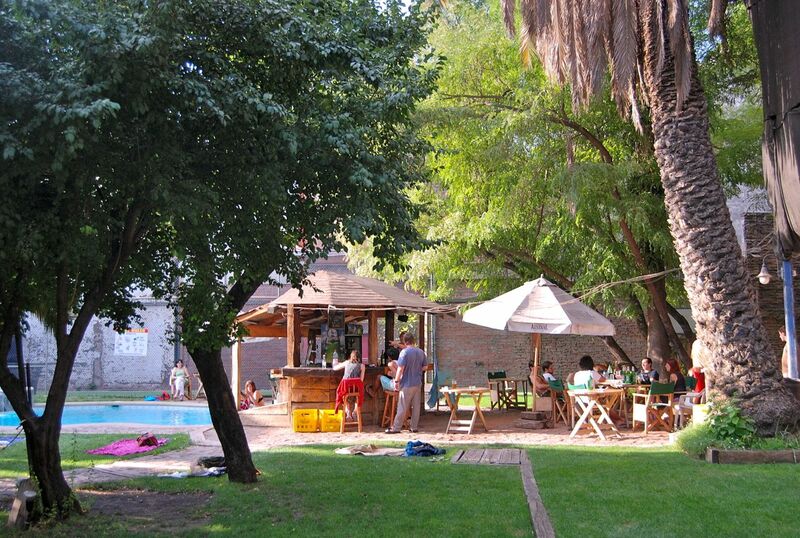 Capital flight is endemic in Argentina, and yesterday things got worse for Argentine travelers. 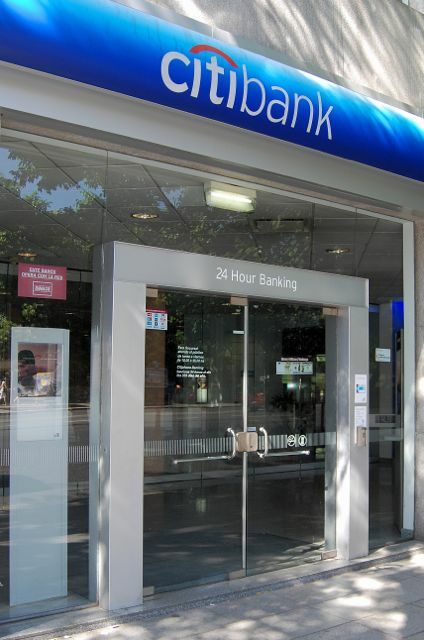 In a surprise move that had analysts shaking their heads, the Banco Central (Central Bank) decreed that, effective April 3, they will no longer be able to withdraw dollars on their ATM debit cards outside the country’s borders. Interestingly enough, that’s the day after the 30th anniversary of the South Atlantic War with Great Britain over the Falkland Islands, but it’s unimaginable that this date is intended to take advantage of a political distraction (nudge nudge, wink wink). Until then, Argentines outside the country will still be able to withdraw US$200—400 per day on their ATM cards, but after that date they will only be able to do so if they have dollar-denominated bank account. With roughly US$15 billion in foreign debt payments due soon, the government appears worried that it will not be able to meet those payments without such measures. It also raises concern among the populace that, as in 2002, the government might “pesify” those dollar accounts, a measure that cost many Argentine three-quarters of their savings a decade ago. Given such erratic policies, it’s no wonder The Economist has excluded Argentina’s official statistics from its worldwide summary, on the grounds that “We are tired of being an unwilling party to what appears to be a deliberate attempt to deceive voters and swindle investors.” The current dollar measures encourage evasion - at which many Argentines are expert - and seem like a panic measure. The story of the Dutch boy sticking his finger in the dike may be a cliché, but it appears to be the right metaphor for the government’s economic policy. The next big failure might not be just around the corner but, as my friend Nicolás Kugler writes, “the government keeps making a mess of this country, something 54 percent of voters apparently enjoy.” That’s the majority that re-elected President Cristina Fernández de Kirchner last October and, apparently, most of them will spend their vacations within their country's borders - whether they want to or not. 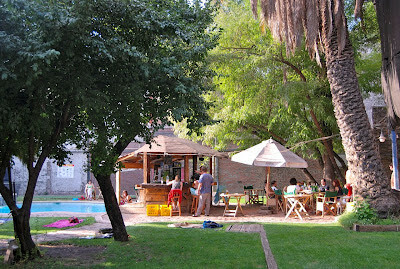 It’s been hot in Santiago, and the heat wave is supposed to continue for most of the month. According to the forecast, the highs won’t fall below 30° C (86° F) until March 15th and, in the past few days the mercury has topped out around 33° C (92° F). Normally Santiago, which sits about 550 meters (roughly 1,800 ft) above sea level, cools off at night, but that hasn’t been the case on some nights. I’ve been staying at a large, high-ceilinged room at Barrio Brasil’s La Casa Roja (its gardens and pool, pictured below, offer some relief). Even then, the room stays warm enough that I’ve been sleeping atop the sheets, rather than beneath them. I’ve felt the heat walking around town, despite sticking to the shade as much as possible, and the intensity of the sun – the UV intensity has been very high, a concern to those who, like myself, have had the unpleasant experience of a melanoma. Where I’ve noticed it most, though, has been aboard the Metro, the city’s exemplary underground railway. Usually, in Santiago, I don’t need to do anything first thing in the morning but, the past couple days, I’ve had relative early appointments that required me to take the train when it’s packed with commuters – and I mean packed. The combination of high temperatures and SRO density has made the commute a test. At downtown’s Los Héroes transfer station where I often board, passengers have been lined up five and six deep or more along the entire platform; those disembarking barely have time to get out before the crush starts in the other direction. These older stations on the original Línea 1, while well-maintained, lack air-conditioning and the concessionaires have tried to compensate by locating wall fans, with a small hose that creates a spray (pictured above), to cool things off. That doesn’t work particularly well unless you’re standing directly in front of it. Aboard the train, of course, that means near-suffocating conditions and, by the time I got to my stop 12 stations to the east, it was a relief. Later that same day, though, and today as well, I had reason to take the newer Línea 4 south from the Tobalaba transfer station, and it was a revelation – temperatures in the station itself were mild, and the glistening new cars along that line (pictured above, outside of rush hour) were among the first in the system to be air-conditioned. Late last year, the Metro acquired 12 of these trains, of nine cars each. Meanwhile, construction is evident along much of Línea 1, as the Metro modernizes and upgrades stations whose interiors, though well-maintained, are outdated 35 years after the system opened. It bears mention that I have never seen graffiti on any Metro station or car – I can’t say it never happens but, to all appearances, the taggers’ work never lasts for long. I can’t help but contrast that with the Buenos Aires Subte. 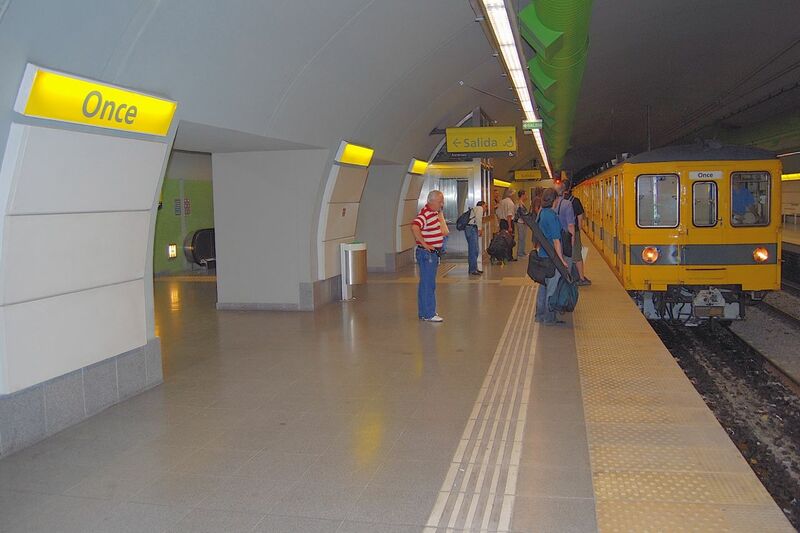 To be sure, there are sparkling new stations on the cross-town Línea H (such as Estación Once, pictured above), but many older stations are badly in need of renovation, especially along the original Línea A and Línea B. That’s without even mentioning the fact that, on Línea B, many relatively new cars are enveloped in graffiti that recall the chaotic New York subway of the 1970s. 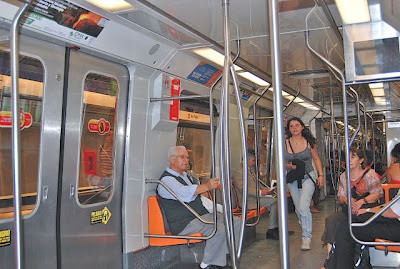 I’ve compared the two systems in greater detail elsewhere, so I’ll just add that, in Buenos Aires, public transportation is a political football. 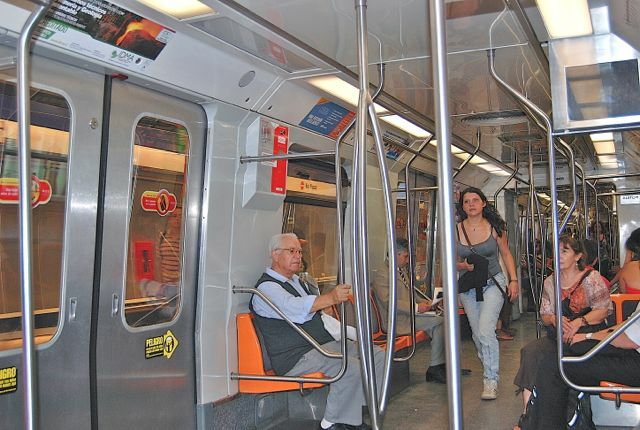 The federal government and the city are presently arguing over responsibility for the system, while the concessionaire Metrovías sits – on its hands, apparently - and waits. 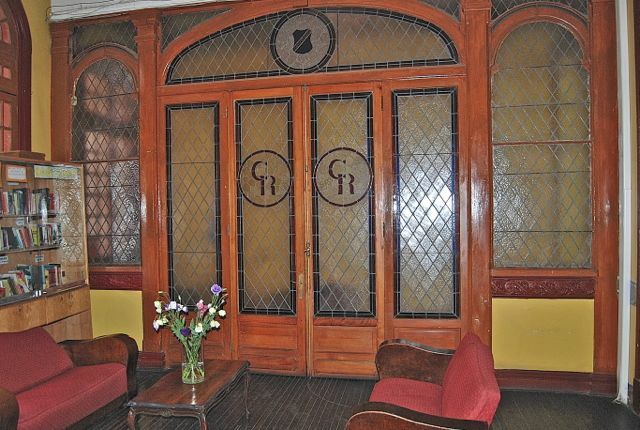 Today’s entry covers the anticipated rupture of Argentina’s Moreno Glacier, the renovated headquarters of Chile’s national tourism service, and supplementary analyses of the recent commuter train wreck in Buenos Aires. In 2004, while traveling in Patagonia, I missed the rupture of the famous Moreno Glacier – an event that happened 15 times in the 20th century - by just a few days. It happened again in 2008, when I was several thousand kilometers north in California and, from the look of things, it’s due to recur any time now in Parque Nacional Los Glaciares. With that in mind, visitors are starting to crowd the gateway town of El Calafate and, presumably, camping out in anticipation of the spectacle – even though, strictly speaking, no camping is permitted in that part of the park. For a current image, visit this link which, however, does not refresh automatically. I’m closer this time than I was in 2008, but still a couple thousand km north in Santiago de Chile where, even though there’s snow visible on the Andean summits to the east, today’s forecast high is 92° F (33° C). The only readily available ice should be chilling mojitos, caipirinhas and other mixed drinks in the bars of Barrio Bellavista and elsewhere (Chile’s own national cocktail, the pisco sour, comes chilled but ice cubes would be a desecration). 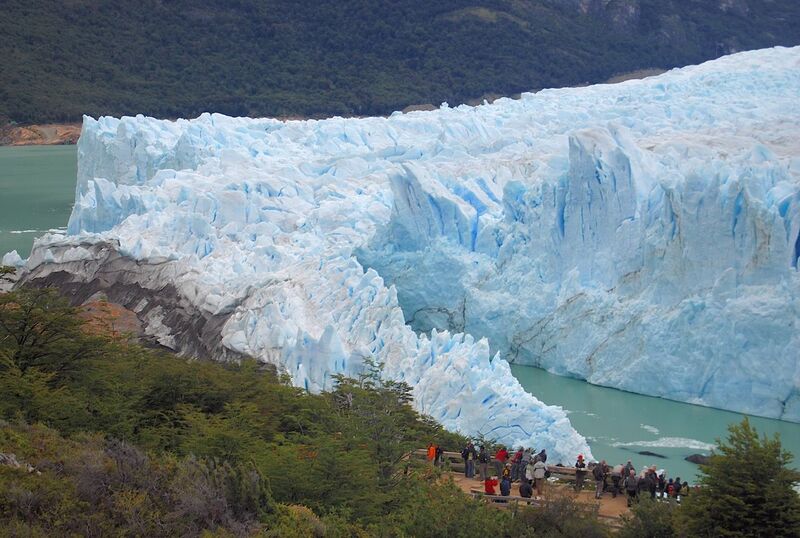 Late Update: According to the Buenos Aires daily Clarín, the glacier finally ruptured between 3 and 4 a.m. this Sunday morning, March 4, in the midst of a storm. So nobody actually got to see it this time. Yesterday I had a meeting with a friend in the marketing department of Sernatur, Chile’s national tourism service and, almost as an afterthought, she took me to the utterly renovated quarters in which they receive the public. What was once a drab bureaucratic hall where indifferent staff passed out maps and pamphlets is now a cheerful visitor-friendly facility that’s drawn praise for its innovative design. There are touch-screen computers everywhere, comfortable seating, and informative displays that encourage visitors to roam about while waiting their turn to talk to an attendant when things are crowded. 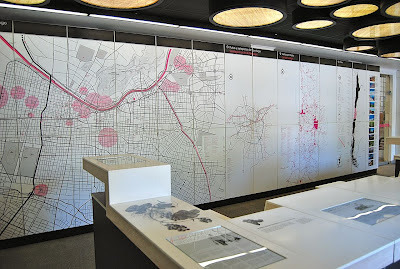 Being a geographer, I particularly enjoyed the mural map of Santiago that points out its liveliest neighborhoods with circles imposed on the city’s grid. 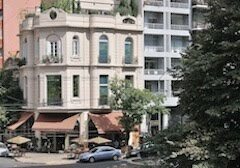 In the borough of Providencia, midway between the Manuel Montt and Pedro de Valdivia Metro stations, it’s a useful service for any Santiago visitor. 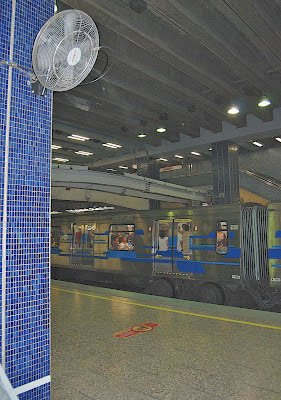 Last week I wrote about the fatal train crash on the dilapidated Sarmiento Line that serves the Buenos Aires station of Once from the city’s western suburbs. More recently, two Buenos Aires Herald columnists, James Neilson and Martín Gambarotta, have written extended analyses of the background and political implications of the event that are well worth reading – their conclusions are similar to mine, but they offer much more detail than I was able to do at the time. What seems certain, sadly, is that nothing positive is likely to emerge in the aftermath.